An experienced musical director and bandleader, Tony Whittaker presents an entertaining programme of music in concert. 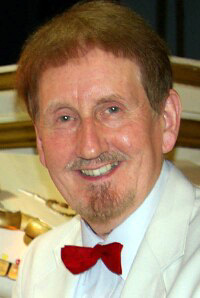 His extensive memorised repertoire includes West End musicals, Standards, Latin, Film music and singalong WW2 medleys. Well-travelled on the concert organ circuit, Tony’s relaxed and informal style makes for an enjoyable concert. Tony is also an accomplished pianist, be it in cocktail-style, stride a la Charlie Kunz, light classical or George Shearing ‘locked-hands’ style. With seven CD albums to his credit (six electronic/one theatre), Tony’s latest album showcases his original compositions. Entitled “Compose Yourself” it features 16 tuneful melodies played on the Kurzweil piano, Hammond organ and strings. Audio samples on the MSS Studios website.